If college is supposed to be the best time of our lives, why are so many students unhappy? What causes a well-adjusted and academically successful high school graduate to suddenly flounder when he reaches college? Why might she start to skip classes, binge on alcohol, or engage in unsatisfying hook-ups? Where does the anger and self-doubt come from, and why is it directed at loving parents or the student himself? 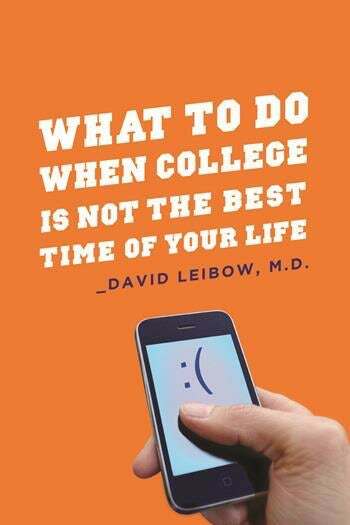 Drawing on years of experience treating college-age youth, David Leibow, M.D. provides fresh, honest, and realistic answers to these and other important questions. Instead of adventure, liberation, and a triumphant march into adulthood, many college students experience shame, regression, and social and academic failure. Yet by understanding themselves better and making reasonable changes, students can grow from these challenges and turn bad choices into wiser personal and educational decisions. Leibow focuses on issues common to college settings-anxiety and depression, drug and alcohol abuse, laziness and work avoidance, body-image problems, and unhealthy relationships-detailing coping strategies and professional resources that best respond to each crisis. His intimate knowledge of campus life and its unique challenges adds credibility and weight to his advice. Reorienting the expectations of parents and students while providing the tools for overcoming a variety of hurdles, Leibow shows how college can still become one of the best times of our lives.